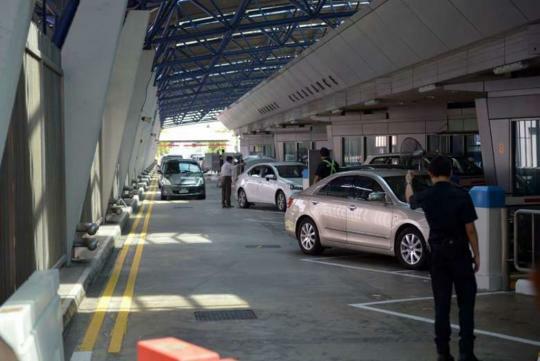 The Immigration and Checkpoints Authority (ICA) is looking into automated self-clearance for all cars, following a revamp of motorcycle counters at both land checkpoints that will be completed tomorrow. The automated self-clearance system allows motorcyclists and their pillion riders to scan their thumbprints and have their passports verified by a machine to clear immigration. ICA confirmed it is considering automating car clearance as well but would not give further details, including whether it would be similar to that for motorcycles. Starting Monday, Singapore- and foreign-registered motorcyclists and their pillion riders can carry out self-clearance at the same time at 164 automated checkpoint counters, which were rolled out progressively. Initially, the automated counters could clear only single riders. "These automated counters speed up motorcycle clearance by up to 30 per cent and help reduce congestion," said the ICA. This allows the ICA "to redeploy officers to other critical tasks such as conducting checks on travellers with higher risks". The roll-out of the automated self-clearance system comes after the ICA won an award at the annual Global Performance Excellence Awards, which recognises organisational excellence, at the Asia Pacific Quality Organisation conference last month. as the world's first dedicated self-service machine. Among the new services introduced are two self-service kiosks called iCollect, which were launched in 2013. iCollect involves two kiosks that allow for passport collection. Users make an appointment online before picking up their travel documents from the kiosks at the ICA building. When doing so, they are identified automatically by facial features and fingerprints. The same machines currently allow applicants to collect their identity cards and Long Term Pass cards from the kiosks, with a take-up rate of some 65 per cent on weekdays. On Saturdays, all slots are fully booked. But this forms only a fraction of the documents collected from the ICA every day. ICA said it is building on the success of iCollect to explore the viability of robotics to automate document collection. Last year, a total of 675,747 Singapore passports were issued, including those collected through the automated kiosks. The following article is written by Seow Bei Yi, a correspondent with The Straits Times.